Thursday night saw the opening of Dan Kitchener’s solo exhibition ‘Queen of Neon’ at the 5th Base Gallery, a show we have eagerly been awaiting for some time and one that certainly didn’t disappoint, demonstrating Dan Kitchener’s distinct style and the range with which he can portray his subjects. Primarily known for his Liquid Lights impressionistic neon cityscapes, Dank also works with portraits of Geisha’s, tying in with his predominant focus on Japanese culture in his Liquid Lights works and he has also increasingly of late set to fuse these two subjects together in single pieces. The show of some 20 canvas works predominantly focuses on Dank’s Geisha works, taking on a much more figurative focus, though there are some cityscapes in the mix also, offering ample demonstration of where Dan Kitchener’s work has been at over the last year or two as well as offering a intriguing glimpse into new directions Dank is taking his subjects. It is only fitting that a show fueled with Geisha themed works be held in the Brick Lane area with his first Geisha portrait on the street painted in the Brick Lane area, something which has led to Dank developing his style and approach to these portrait works. This is something visible in the exhibition with his nearly singular subject of Geishas presented in an impressively broad range of styles and poses, from the more subtle detailed works to the more energetic and icreasingly abstract works. In the show Dank takes a very traditional subject – the Geisha, whose very existence is that of a living ornament, a spectacle unto itself, and imbues the delicate nature of his models with a real sense of energy, often with a very modern feeling that is almost at odds with the conventional long established role of the Geisha in Japanese society. Dank takes a classic portrait setting, something that goes back as far as painting has been a practiced medium, and adds a real sense of movement and fluidity to his subjects, moving away from something that is classically very still and detailed to something that’s more expressive and emotion driven, conveying a real brief moment in time. What is noticeable is how this sense of movement which has long been present in his Liquid Lights works has increasingly transferred to his portraits, the speeding lights of the city are imbued in the people he paints. Certainly something we very much enjoyed seeing in this exhibition. We don’t like to make excuses for our photos but our pictures don’t do the works justice due to the glare from the typically bold spot lights one often finds in a gallery setting, so you will just have to take our word that the works are far more impressive and absorbing than our pictures offer, or better yet if London way go see them for yourself. Additionally we always like to pick a few favourites from an exhibition and have marked a few that particularly stood out for us below as they appear in the pictures. The show runs until April 6th, if you are London bound and haven’t already, be sure to head along to check out this excellent exhibition, you won’t be disappointed. If you aren’t London based we hope you enjoy the images below. The exhibition can be found at the 5th Base Gallery in Heneage Street just off of Brick Lane. This was a favourite from the show for us, very interesting and different approach to works we have previously seen from Dank, presenting an interesting take on light and shadow, which is fundamental to what Dank paints, portrait or cityscape. This work certainly stood out, presenting quite the leap for Dank’s impressionist approach to his cityscapes, really creating a sense of movement and the passage of time. We love the real fluid nature of this painterly piece, as well as the absorbing colour palette. One of the more impressive works from the show, very different to anything we have previously seen from Dank, and while broken down on the detail, it is so full of life and energy. 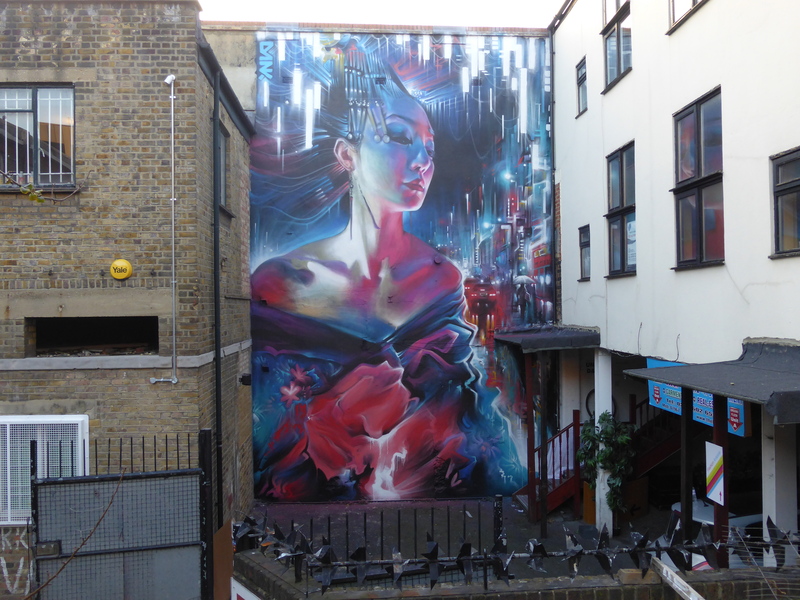 The stunning ‘Queen Of Neon’ mural outside the 5th Base Gallery. You can view more pictures of this work being made and finished in our post (covered here).